A Pittsburgh resident speaks against the UPMC Mercy Expansion at Tuesday’s city council meeting. Council passed a motion to let the hospital expand shortly afterwards. 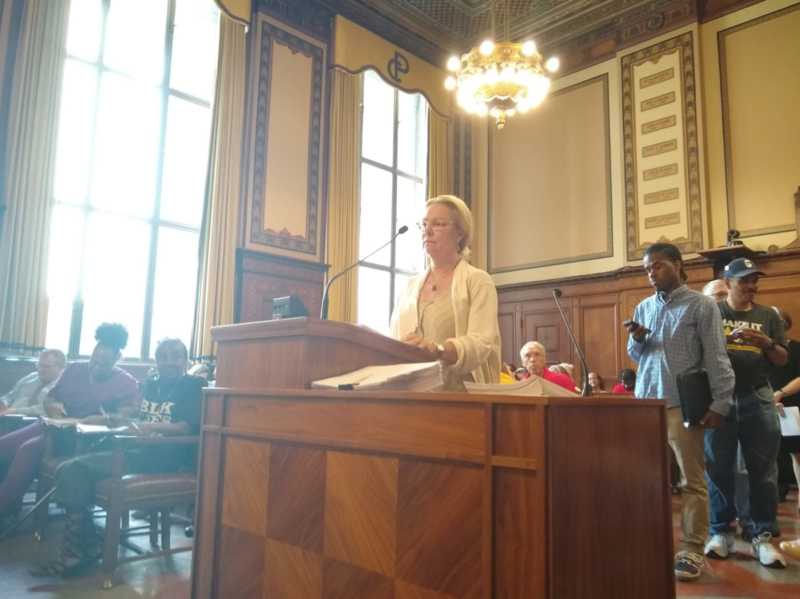 Pittsburgh City Council voted 7-2 in a crowded session on July 31 to approve UPMC Mercy’s controversial expansion plan – council members Deb Gross and Darlene Harris voted against the measure. The vote followed two hours of searing public comments against the expansion by over 35 local activists, UPMC staff members and patients of the $16 billion healthcare giant. No one spoke in favor of the bill during the public comments portion of the session. “Wellness is only afforded to those [UPMC] deems worthy,” Dwayne Thomas of the PA Alliance for Retired Americans said to applause from the crowd. The bill approves an amendment to UPMC’s institutional master plan that would allow them to build their $400 million Vision Rehabilitation Center on a parking lot at UPMC Mercy. It follows on the heels of a public hearing two weeks prior to the vote, after which city council members agreed to delay a vote until local groups could craft a binding community benefits agreement with UPMC. But Pittsburgh United, a pro-union advocacy group, argued that Lavelle’s CBA didn’t go far enough. It demanded that a benefits agreement require UPMC facilities admit all Pittsburgh residents regardless of their insurance carrier, build more primary care facilities in low-income areas, pay living wages to their employees and guarantee those employees the right to unionize. Jennifer Raffanan-Kennedy, the Executive Director of Pittsburgh United, said in an email statement July 30 that Lavelle’s CBA did little to meet protesters’ demands. Speakers were critical of Lavelle’s CBA the day of the vote, citing UPMC’s history of union busting, the closure of its Braddock hospital and its separation with Highmark as reasons that the healthcare giant needed to be bound to a more stringent community benefits agreement than the one Lavelle provided. Multiple speakers also called him out for a perceived conflict of interest in this situation. Lavelle sat in silence in response to Packer’s question. He later clarified after public comments that he didn’t believe his wife’s position constituted a conflict of interest for him. “[Her membership on the UPMC Mercy Hospital board] is a non-paid position. She has to sign a yearly conflict of interest policy,” Lavelle said. Multiple speakers praised council members Gross and Harris, who stated their opposition to the bill before the public comments portion. Council members criticized their critics during the voting portion of the meeting, after public comments closed. “These insults back and forth are childish,” District Two Councilwoman Theresa Kail-Smith, who voted for the expansion, said in response to the criticisms. She cited the Allegheny County Labor Council’s written statement in support of Mercy’s expansion as evidence that council was receiving “different messages,” and claimed that activist groups at the meeting were politically motivated. Council President Bruce Kraus also responded to criticism that the vote was rushed in the voting portion of the meeting. Councilwoman Harris proposed a motion to recommit the bill and push the vote to a later date directly after Kraus’s comments. Kraus and five other council members immediately voted against Harris’ proposal, effectively guaranteeing a vote on the bill that day. Strassberger, Gross and Harris voted in favor of tabling the motion for a later date. Gross later said that she was disappointed with the council’s decision not to delay the vote. Council voted to pass the bill shortly after Harris’ motion to recommit it failed. Wood declined to answer questions.